Turfmate Footy Tipping is here for 2016! We’ve come around to that brilliant time of year once again; time to clear your weekend schedules for the next six months because FOOTY SEASON is here! 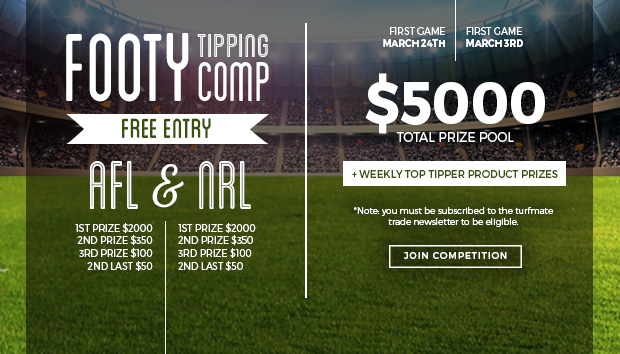 And to celebrate, turfmate are running their very own FREE footy tipping, for both AFL and NRL! This year we have separate competitions running for each code through ESPN Footy Tips, with up to $5,000 in total prize money to giveaway, as well as weekly bonus prizes for top tippers! Sign up for your favourite sport, or if you’re feeling lucky – why not enter both?! The NRL season kicks off Thursday March 3 at Pirtek Stadium where the Parramatta Eels take on the Brisbane Broncos. AFL swings into season March 24 with Richmond and Carlton taking the first bounce at the MCG. PLUS weekly product prizes for Top Tippers! 3. Login and enter your tips for AFL/NRL (or both!) each week to get the top spot, also go in the running for some awesome weekly giveaways. All entrants must be subscribed to the turfmate Trade newsletter to be eligible to enter and win. If you’re not a turfmate Trade reader, click here to sign up now!